If you are an Etsy shopkeeper and want to improve your shop, then you should check out this fun blog called On The Dot Creations. 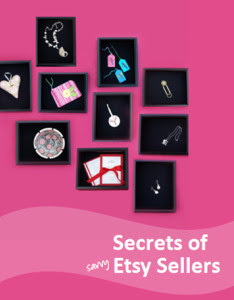 The blog author, Julie, has written some great tutorials on sprucing up your shop and has just published a free eBook entitled Secrets of Savvy Etsy Sellers. Make sure and check it out and download your own copy! - and look for yours truly, as I contributed hint #36 on page 19.